The cast of GRUESOME, the Schuldiner-hailing collective featuring members of Exhumed, Possessed, Malevolent Creation and Derketa, today untethers a very special cover of Slayer’s “Black Magic.” The band’s latest reconfiguration of the old-school appears on the deluxe digital edition of the band’s Savage Land full-length. If you missed it, you can still savor the gore, nakedness and violence of the band’s unrepentantly brutal NSFW video clip for “Savage Land” still playing via YouTube HERE. 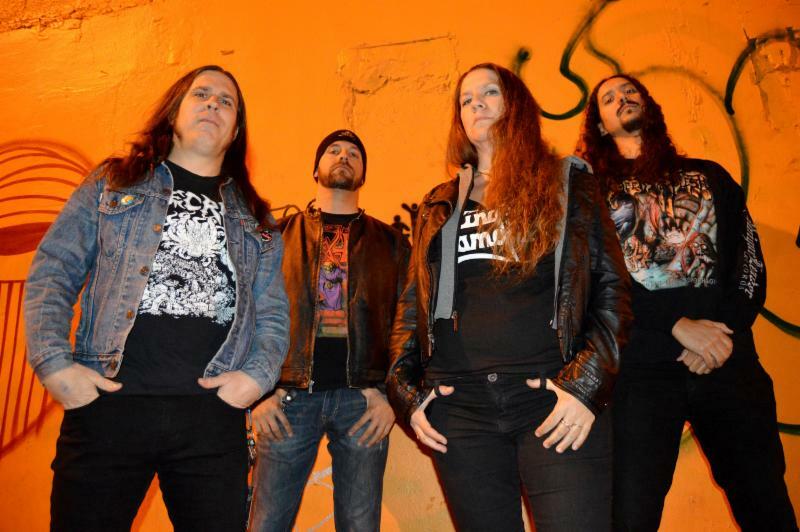 GRUESOME pays homage to death metal’s most celebrated founding American acts, Death. As such, their debut full-length, Savage Land, released last month via Relapse Records, is an addictively punishing exhibition of late-‘80s/early-‘90s Florida-styled death metal that keeps the true sound and spirit of Chuck Schuldiner and Death alive and well. 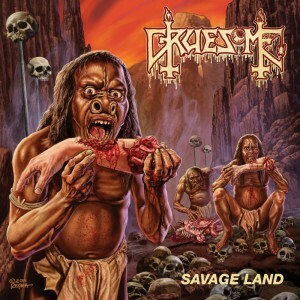 GRUESOME was borne out of guitarist/vocalist Matt Harvey (Exhumed) and drummer Gus Rios’ (Malevolent Creation) mutual involvement with the Death To All tours. After discarding the idea of putting together another incarnation of DTA to focus exclusively on Death’s first two albums, Harvey half-jokingly suggested writing their own songs in that vein. The idea gained traction, and the band had five songs written. Rios later recruited Possessed guitarist Daniel Gonzalez and Derketa bassist Robin Mazen to record the material in Florida. Savage Land was tracked by Rios and Gonzalez at Riversound Studios in Fort Lauderdale, Florida, mixed by Jarrett Pritchard at Mana Studios in St. Petersburg, Florida, and features a guest guitar solo on “Closed Casket” by James Murphy as well as cover art by legendary illustrator Ed Repka (Death, Megadeth, Massacre, Athiest et el).